I have owned this book for at least two years. It was given to me by a former co-worker and she swore it was the funniest book she had ever read. I unfortunately have not picked it up yet and it has sat on my bookshelf untouched. I will also admit that I don’t know what the book is about other than the fact it involves a woman named Bernadette and she has a 15 year old daughter named Bee. I did however recently place it higher on my TBR list and I think I did it mainly out of guilt of having never read it. My goal is to read it before next year. Although seeing as I have held onto it for 2 years without so much as opening it, I don’t know how promising this timeline will be. I will certainly post a review though once it happens, but don’t hold your breath because I’m pretty good at procrastination. This past weekend I decided I needed a bookcase as the current one I have couldn’t handle all of the books I’ve been collecting lately (aka hoarding). I went to Target and picked up one for less than $20 but felt as though it needed something and thus my simple bookcase became a Saturday project. I got the idea for my DIY project on pinterest. 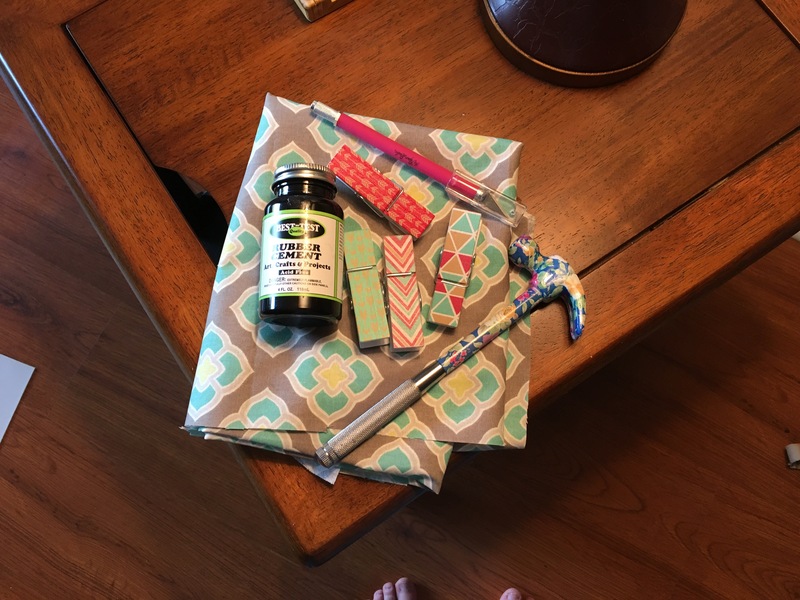 The pin leads to a blog called A Beautiful Mess where the blogger used fabric, rubber cement, and an x-acto knife to transform her corner shelf into an interesting piece of furniture. I found the directions to be simple enough and here is how I made over my plain simply bookcase into something unique. 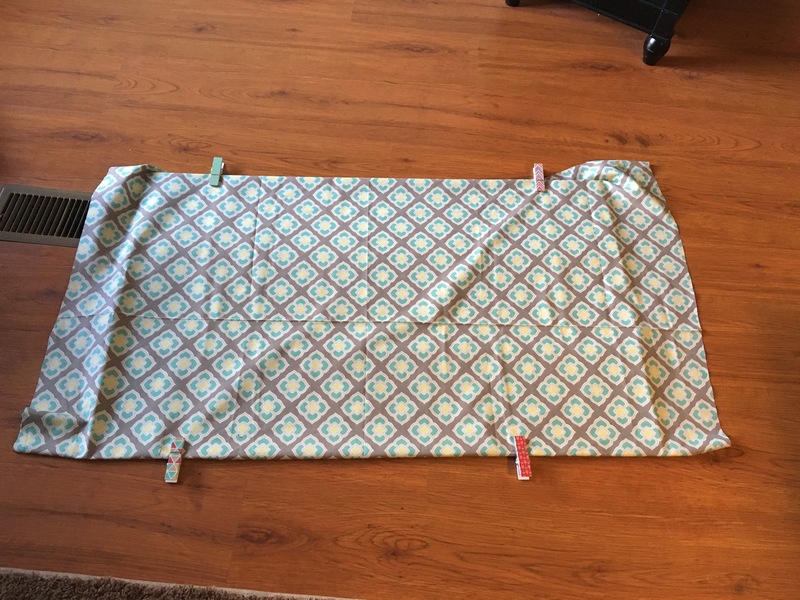 I started by taking the backing of the bookcase before assembling, so that I could cut my fabric to size. In the original directions it says to leave at lease an inch longer than needed so that you can cut with the x-acto knife after placing the fabric along the back to have the most accurate fitting. I probably left a little more than that just in case I didn’t cut correctly the first time. After cutting out my fabric I assembled the bookshelf and attached the back but didn’t add the shelves leaving only the what I refer to as the outline of the bookshelf. I then laid down the bookcase facing up and laid my fabric down with the backside facing up and the pattern on touching the ground. With my fabric, I started in the middle and worked my way out smoothing the fabric down as I went to remove creases and create a flat surface. 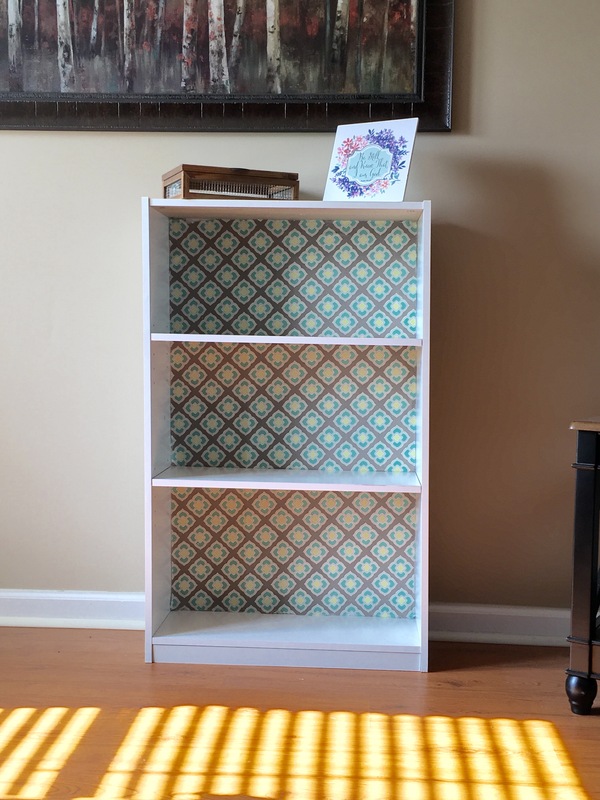 Once my fabric was laid down the way I wanted, I then took the x-acto knife and cut along where the actual bookshelf connected with the back. 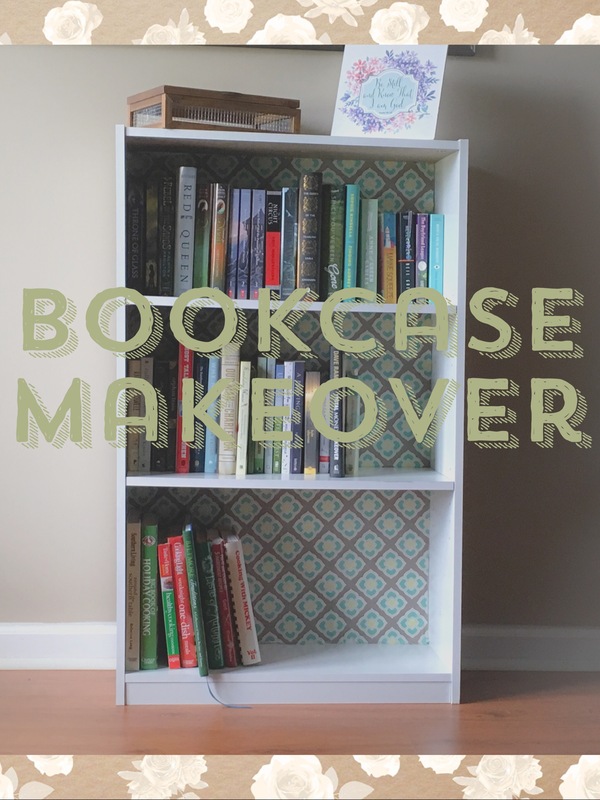 I did this process with the bookcase still on the ground but it may have been easier if I had sat it up right as the cutting with the x-acto knife would sometimes prove difficult. Once completed I was able to immediately add the shelves in as I didn’t have to wait for anything to dry. And I could also begin to add my books and decorations without any problems either. When I was deciding what I wanted to decorate my bookcase with I knew I’d need something to store my bookmarks in. 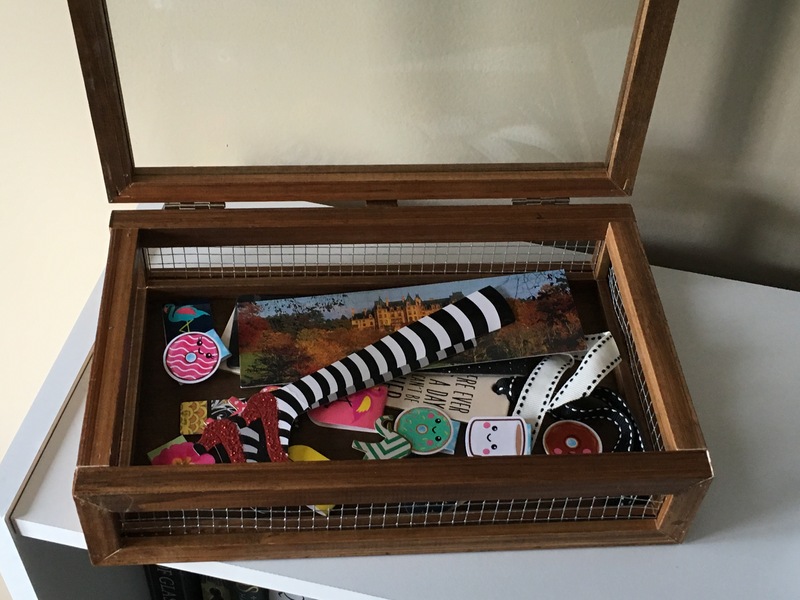 I found this wooden box with glass top at Hobby Lobby. It adds a little something extra and I always have a place for my bookmarks so I don’t lose them! This was an easy project that only took me a couple of hours to complete, but most of that time was taken to assemble the bookshelf because I had a tendency to screw the screws in crookedly and the holes wouldn’t line up with them. Oops! Other than that I did it all in an afternoon and really like how it turned out. If any of you decide to do this DIY I’d love to see it. Which leads me to a great segway (kind of, not really) that I’ve finally updated my social media so you can find me on twitter at Bookofmeghan or on Instagram as mgetti89. I’d love to hear from you! Dani and her best friend Bird love baseball and the collegiate team in their hometown called the Ragland Rattlers. After she reads an ad in the local paper asking families to house the players for the summer, her and Bird hatch (no pun intended) a plan to have their families volunteer. Dani’s parents only agree under one condition, she cannot date the boy they take in. Dani finds that this will be no problem because who wants to date the boy who might accidentally see the bra you leave in the bathroom to dry, of course once the Rattler’s pitcher Jason shows up it makes that one rule a little complicated. This was a CUTE read that was light and quick and perfect for summer. I personally chose it because I love baseball myself and thought that it would be a great story for a lazy afternoon, and I was correct. Dani reminded me a lot of myself in high school and I did find the story entertaining and sometimes funny. What I liked most was that Dani is a super insecure girl. She does have some moments, like most of us do, but in the end she remains true to herself and doesn’t need to date Jason in order to define who she is. I will say that often times when the main female character is obsessively insecure I can’t usually finish the book because it can plague the entire story. But Dani realistic as a female character. I also liked that even though the ending is predictable you get what you want as the reader in the end, which is a happy ending. And sometimes I like to read books like this because they make me happy unlike the more adult romance novels that can make me feel dirty (note: not in a good way). My least favorite thing is how cheesy the story line can get in parts but its a young adult romance novel it’s gonna have some cheese in it given the audience its for. Overall, I can look over it and see that The Boyfriend League was nice read for me. Teen girls. Obviously this is the intended target audience for these books and not 27 year olds but I think anyone can read it who wants a light read. 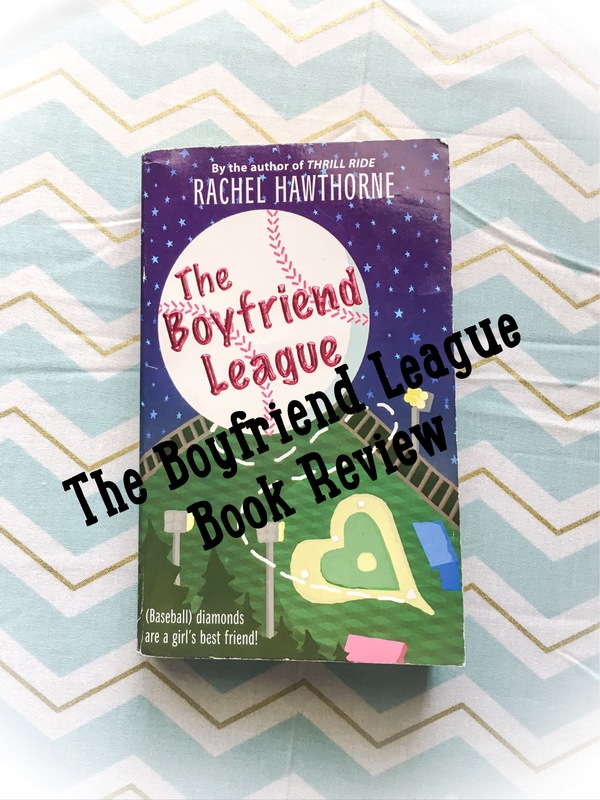 I’d also recommend it to someone looking for a baseball themed romance as baseball is clearly a large theme in the book. If you don’t like cheesy romances, this isn’t for you. Or if you don’t like clean romances because it isn’t of the romance-trashy-variety (I’m not entirely sure that’s a thing). As mentioned in my recommended for section, any one older than 18 may not like it because I do think my 16 year old self would have enjoyed it a lot more. My internet is out at home currently and looks like it won’t be fixed till later this week or this weekend. Unfortunately the only access I have to my blog is by my phone or my work computer. I may not be able to do any blog posts this week but I’ll try to make up for it in the next week! Author Melanie Shankle’s book Sparkly Green Earrings is a memoir about motherhood. More specifically it is a collection of tales about her adventures in raising her daughter Caroline. 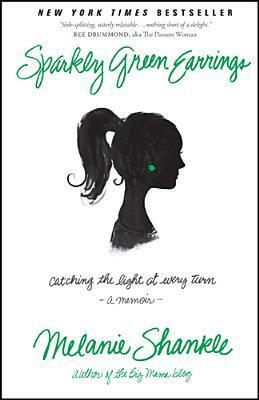 I really liked Sparkly Green Earrings and actually liked it better by reading it after Antelope in the Living Room even though this book is her first memoir published. I will say however that I favor Antelope in the Living Room more than this book though. But what I enjoyed most while reading this book was the author’s sense of humor. The tone of that humor is through out the entire book and had me laughing several times. I also liked the fact that the stories were still relatable and entertaining to me even though I have not yet experienced motherhood. I think if a writer is capable of making the reader able to relate to the stories even though they have not personally experienced it themselves, then that is a great quality to have because the theme could have been easily isolating to anyone who isn’t a mom or a parent. All-in-all Sparkly Green Earrings was a quick read that I would gladly pick up again. Ideally I think this book would be a great mother’s day gift but seeing as that has come and gone Sparkling Green Earrings would be a great beach read. It is only a little over 200 pages so it might be a great travel read to, something that’s easy to read on a plane or on a road trip (that is of course if you are not driving and don’t get car sick). I wouldn’t recommend this book to anyone who has an issue with Christian themes or stories about personal religious views. Much like in my review of Antelope in the Living Room I will restate that the author is known for having a Christian Living themed blog so fair warning is being made if a reader might be interested in this book but don’t like this genre. I’m starting a new series for every Thursday where I go through the books in my collection that I haven’t read yet. I wanted to do it this way rather than a collected one each month because I tend to change my mind and didn’t want to feel like those were the books I had to read. The first book I have chosen for TBR Thursday (by the way TBR means “to be read” for anyone not familiar with the term) is called Scandalous Women written by Elizabeth Kerri Mahon, and it is a book about different women in history and their major roles within it. That’s right I wrote major. Despite what we have often learned in our history classes, women did have a role in historic events that have often been untold even though they have changed the landscape of nations, empires, and cultures. From what I’ve seen when I’ve flipped through the pages so far is it looks as though the book is divided into different sections for each woman and I’ve noticed it has lots of names I’ve never heard of before, but does still include what you might expect for women of history such as Cleopatra and Marie Antoinette. I originally found this book a little over a year ago while browsing the History section at Barnes and Noble, and I figure I should finally find the time to read it because I honestly feel like it is judging me while it has sat on my bookshelf untouched. The title alone caught my interest when I first came across it as I hadn’t seen a book with that subject matter before, and who wouldn’t want to read something with scandalous in the title? My goal is to read Scandalous Women before the summer is over. I think it will be an interesting and fun read, plus I may even learn something in the process and it could prove to be a good book to travel with. Well I hoped you liked the first post of this series. I could probably do this every Thursday until I’m 80 because that’s how many books I own that I have read yet. Though I’m probably not the only one with this problem. 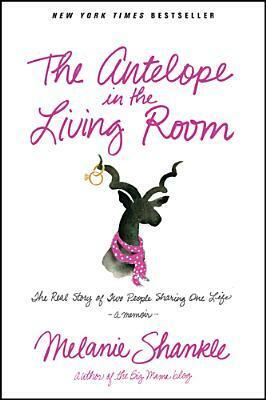 Antelope in the Living Room is written by an author who is also is a blogger. She chronicles her 16 year marriage with husband Perry in a version of short stories within each chapter. 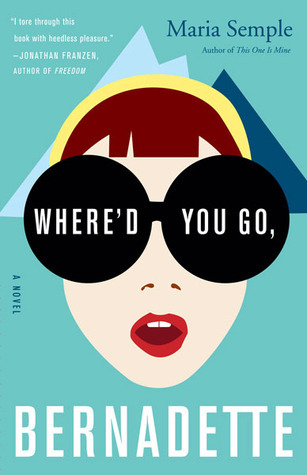 Melanie Shankle’s sense of humor is written in every word and truly made this book highly enjoyable to read. I don’t really have anything negative to write about Antelope in the Living Room except that some of the stories can seem randomly woven together at times. Other than that it met my criteria of being entertaining and I didn’t find myself wanting to do something else while reading it. I also bought the book for my mom she has been enjoying too. She uses pop culture references throughout the book and it does tend to read like a blog but she is blogger so all is forgiven. It’s a good lighthearted book that perfectly jump started me to start reading again after nothing seemed to grab my interest for the past two months. That alone gives it a 5 out of 5 for me. I would recommend Antelope in the Living Room more of a female audience though any guy might find it funny too, I feel as though it may be more appreciated from a woman was it is a woman’s perspective on her marriage. I would also recommend this to a group of friend as it could be a great book to read together. And for obvious reasons this would anyone getting married or is married may enjoy it too. Someone looking for a serious read may want to steer clear this won’t be your book. Anyone who doesn’t like Christian or Religious aspect, the author is a Christian blogger and her books are sold in the Christian living section (I only note this because people still wrote negative reviews on this simple fact and I’m not really sure how they stumbled across the book if they don’t like that genre.) It may not also be of interest to a reader if a collection of stories instead of one streamline read is not your style.